What first interested you about the engineering industry? I didn’t know about it at first. I was doing medicine and wasn’t enjoying it at all. I only really liked anatomy and physiology, which is basically the parts and how they work. I wanted to switch but didn’t know what to do. I was flipping through a prospectus looking for ideas. I took a look at Dentistry… and kept reading when I got to E… engineering. I had never heard of it as an option for girls and realized this was it! This is what I want to do! I started out at university doing a foundation year while I worked, doing both full time to be sure I liked it before I fully committed to being an engineer. When I went to Newcastle University, I attended graduate fairs in my first year to learn names and contacts in the industry and added them on LinkedIn. I then went to a gradate fair in my second year, armed with my polished and printed CV. I asked every company there if they were considering summer interns and even if not, to please take my CV for consideration. I then followed up with every company for weeks. In the end, I went for 3 interviews and accepted a placement with none other than Penspen. I did the same in my third year but I wanted a different experience, so I went to do a materials specific internship. When I graduated, I had made contacts within the industry and already established myself as an ambitious and determined engineer, so finding a job as a post-graduation wasn’t too hard. What advice would you give to women looking to work in the engineering industry? There is sexism – but only slightly more than you’d get in any other industry and generally only by a few different cultures. For example, the older generation that are not used to having women in the industry. It has already evolved in the 9 years I have been in the oil and gas industry, and for the better. The only thing that could hold you back is yourself. If you’re going to make your mark in the industry, you are going to have to be excellent. You will be scrutinized more as a woman but you will be respected for your hard work. My advice is to do your best to go after what you want – no one can ask any of you more than that – and don’t be afraid to ask for help. I am both a Project Manager (PM) and an Integrity Engineer. I manage larger projects and am the PM Policy go to person for the North East. Not only do I work as a PM but I get to do some of the technical integrity work on both my own and other projects, which means I get to keep it interesting. What do you enjoy most about working in the engineering industry/working for Penspen? I find working in the engineering industry varied and interesting. I like a challenge and learning new things, or I get bored. As a PM/Technical Engineer, there is always something different to work on, especially at Penspen given the type of work we do. I enjoy the matter of fact attitude most engineers take and the straight forward nature of the work we do. Integrity is about predicting the future or trying to find the reason behind something; you’re basically a psychic Poirot on the nerdiest treasure hunt ever! What would you recommend about your role to young women and girls? You get the freedom to be yourself. No one cares about how you look, just your capability and willingness to learn. This is one of those rare occupations where your passion can truly drive your career. Not only that, but given the few women in the industry, there is a lot of peer support and mentoring available to our ladies. 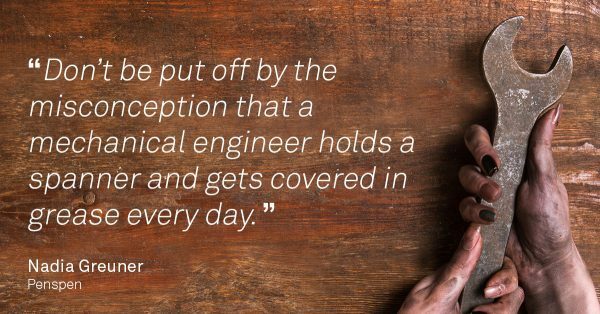 Don’t be put off by the misconception that a mechanical engineer holds a spanner and gets covered in grease every day. That is a choice we make. We can go to work in Louboutins if we want to. It is not only for men. Follow your passion and learn about the opportunities available to you. Do internships, ask for tours and chats, call up HR or local universities to put you in touch with alumni. You have to do your day job almost every day for the rest of your life – you might as well enjoy it!